Buying a yearling at a horse sale is often a roll of the dice. Trainers do their diligent homework regarding the bloodlines of a youngster and are there at sale time to check out the conformation of a horse going through the sale. Financial considerations obviously play a big part on a decision to bid or not and at what cost nevertheless when it comes down to the bottom line in most cases that decision belongs to the potential horse owner. After all it’s he or she who is plucking down the money with hopes the yearling will not only make it to the races but also will be good enough to eventually be a plus and not a minus in the new owner’s checkbook. 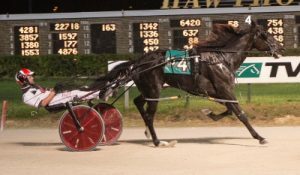 Back in 2016 at the Walker Yearling Sale trainer Gerry Hansen and his primary owner Shelley Steele eyed-balled the young ICF trotter Picky Picky Valor has a potential addition to Hansen’s Stable. The son of Yankee Valor was out of the broodmare Heather Doreen, making him a half-brother to the successful trotter All About Cowboys (1:55.3). 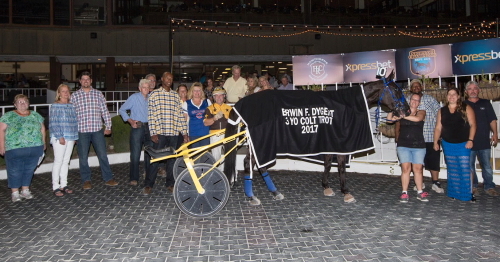 Shelley had an effective Yankee Valor trotter a couple of years earlier in Cruisin Valor. 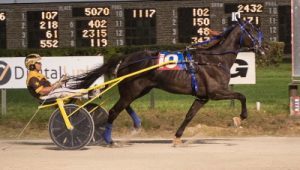 He captured the 2-year-old Hanover stake at Balmoral in 2014 and was second in both the Springfield and Du Quoin State Fair finals, dropping neck decision both times to Captain Greedy. It appeared Hansen won the debate when “Picky” went through the auction unsold. Has it turned out it was Shelley who eventually got her way. “The horse went through the sale unsold but when I told Gerry I was going to get something to drink I ran out of there and tracked down Kenny (Chupp, the horse’s owner and breeder) and asked how him much he wanted for Picky. We agreed on a price and I came back and told Gerry he has a new horse in his barn,” said the hands-on horse owner. “When Gerry started working with ‘Picky’ he told me the horse was lazy and was looking around at everything. He said the horse had a bad attitude but all of a sudden that changed. He was different horse when we put him out there with another horse. “Picky was behind the other horses but I don’t care if they make it as a 2-year-old or not, like most owners do. I rather have a good 3 or 4-year-old trotter. 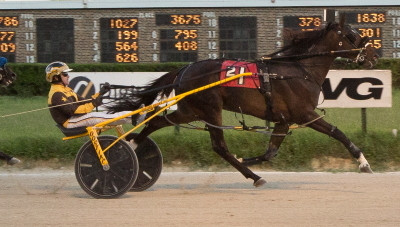 Picky Picky Valor won one race in eight starts and made a little over $5,000 in his uneventful first racing season. It became an up and down sophomore season for Picky Picky Valor and at times a very frustrating one for his trainer. “It seemed that every time we thought we had it figured out with the horse something would happen on the race track, usually in a big race,” lamented Hansen. 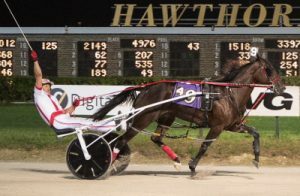 “Picky” won his opening leg of the Busse Late Closer Series at Hawthorne in May and was third best in the final for open company trotters. He was fourth in his first Dygert ICF stake series leg and second in the next at 153-1 odds when never found racing room until it was much too late in the lane. disposing of his “nemesis” Louscipher. Nonetheless, the $50,000 Springfield Final turned out to another huge disappointment for Steele and Hansen. In the Pronto Don at Du Quoin “Picky” trotted a 27.4 second quarter when he came out of fourth and powered to the front with driver Brian Carpenter. The horse was almost four lengths on top at the 56.4 half and six lengths on the lead mid-way down the stretch when he got leg weary and was passed by the winner Louscipher. In the fourth leg of the Dygert Stake Series “Picky” ended up second best when got overtaken in the lane by, you guessed it, Louscipher. Hansen didn’t have his owner’s bubbling confidence going into the championship. Gerry got past his nauseous feeling before the Night of Champions rolled around. Meanwhile his owner was a woman of a few words when she was viewing the championship trot that night. With over $96,000 on his card as a 3-year-old Picky Picky Picky is currently getting a well-deserved rest at the Hansen farm where the top priority is fattening up the trotter. Captain Crush: Last week’s column horse Captain Rhett, this year’s Carey champion, came up with am an impressive victory Thursday night at Northfield Park. The Jim Horvath trained ICF 3-year-old had the eight-hole on a nine-horse field on the Ohio half-miler, spotted the field 13 lengths at the half, and still crushed his opposition in a $6,800 conditioned pace. 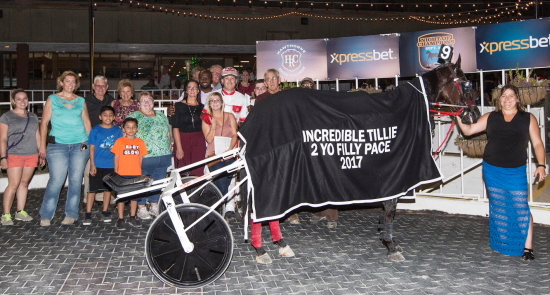 The one-plus length win was in 1:53.2 (28.1 last quarter) for Illinois owners Harvey Grieff (Odell) and Robert Verdun (Pontiac). Ryan Stahl drove Captain Rhett ($16.00) to his latest victory. Most of us who don’t have a wagering interest in a horse race tend to root for a “little guy,” a trainer with a small stable that doesn’t usually doesn’t have the betting favorite in a big race and has never had a horse who won a six-figure event. When Captain Rhett exploded in the lane on Hawthorne’s Night of Champions with driver Marcus Miller and captured the $180,000 Robert F. Carey Memorial Championship for the 3-year-old ICF colt pace, I’m sure there were plenty of veteran horseman and players, who were happy for trainer Jim Horvath. The 71-old Horvath has been one of those “little guys” on the Chicago circuit for a number of decades. From time to time Jim has had some good horses, but he never had been in the winner’s circle after a Super Night type of championship. Of course, that all changed on Hawthorne’s 2017 Night of Champions for the Chicago native when his “trip horse” Captain Rhett got the right kind of trip for Illinois owners Harvey Grieff (Odell) and Robert Verdun (Pontiac). Horvath has certainly paid his dues before this year’s big reward. Jim has been involved in Illinois harness racing for the last 43 years, with some of those racing seasons far from prosperous years for his often small sized Chicago circuit based stable. Horvath knew he sent out a horse on the Night of Champions with a solid chance to win the Carey Final, but he also understood some things had to go his horse’s way to succeed. A fast early pace was expected in the Carey Championship and it turned out to be even quicker than we all imagined when the 10-horse Ima Skydancer shot out and took the field to a startling 54 second flat first half. Marcus had Captain Rhett in fifth position, some eight lengths back at the bruising half, and looked ready to make his move. Captain Rhett got into high gear near the three-quarters (1:23.1) and his 26.4 last panel gave the Horvath trainee an almost three length victory in 1:50.3. Marcus was the sixth different driver in Captain Rhett’s 3-year-old campaign. The son of Duneside Perch, out of the Sportsmaster mare Scarlet, had the fastest mile of the year in the state by an ICF pacer with his 1:49.4 clocking in the Springfield championship with Kyle Husted at his lines. After the horse’s fourth place finish at Du Quoin, a third in a Hawthorne conditioned pace, and a fourth in the fourth leg of the Carey series, Husted made a decision to switch to Slzburgerslzburger for the Carey showdown. “When that happened I told Harvey (owner Grieff), let me give it a shot and call Marcus and see if he’ll come in from Pennsylvania to drive our horse. He was here (on the Night of Champions) last year and I thought he might come back if he had a good horse to drive in a championship. Horvath became involved in harness racing when the sport was beginning to peak decades ago on the Chicago circuit. “I’ve had some nice horses over the years. One of them was Anxious Nate RK who won 16 races for me and made over $100,000. He won his Dan Patch elimination (in 1995 at Sportsman’s), but the horse got locked-in during the final. 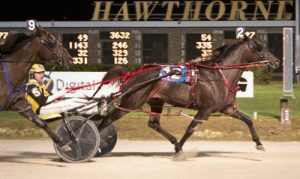 “The Captain” banked $131,229 in his sophomore campaign and is now being pointed for Hawthorne’s upcoming winter meet. Racing for this weekend at the Springfield State Fairgrounds has been postponed due to inclement weather. They are considering a new date, but nothing official yet. Check back for an update. Owners/Trainers please be aware that if your horse finished 6-10 on the Night of Champions Races at Hawthorne the 5% for the trainer that traditionally comes out of the account was not taken out in this instance. Please look closely at your statement with the horsemen’s bookkeeper to account for this.